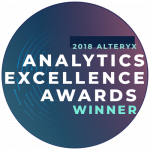 We won the Alteryx Excellence award! Climber has been awarded an Excellence Award at Alteryx’s Inspire 2018 event for its Crime Predictions App. The use case was selected from over 100 entries, the prestigious award was presented in the closing keynote. The Conference saw more than a thousand data scientists, analysts, IT and business leaders attend. The award meant a share of the total $20,000 has been donated to The Dog’s Trust charity. The Crime Predictions App predicts crime rates in the England and Wales for the next few years, the information could be used to maximise spend on staffing, how best to allocate resources in specific time frames, and identify groups of areas to understand why that level of crime occurs in the first place. Crime today is a sensitive topic – it’s on the rise and we need to understand the implications to best understand how to deal with it. Using Alteryx allowed us to combine vast amounts of unstructured public data from multiple data sources, which we easily prepared it for advanced analytics. We utilised advanced techniques to produce meaningful insights so that we could understand and be ready for what is highly likely to happen – the key to a stable foundation in delivering valuable, actionable insight to ensure high quality decision making. We predicted crime rates with a higher degree of accuracy and demonstrated how predictive analytics can be applied to real-world scenarios. We showcased our results using Qlik Sense, a highly accessible tool that allows you to understand the story that we are telling. Our findings were presented to Police Force staff and Press in a webinar, and overwhelmingly positive feedback was received.